A big part of my church's special-needs ministry is playing. Playing may not sound like Sunday School, and it took a while for me to come around to the idea. I have 5 tips for playing while serving, plus a free game for you, so keep reading. 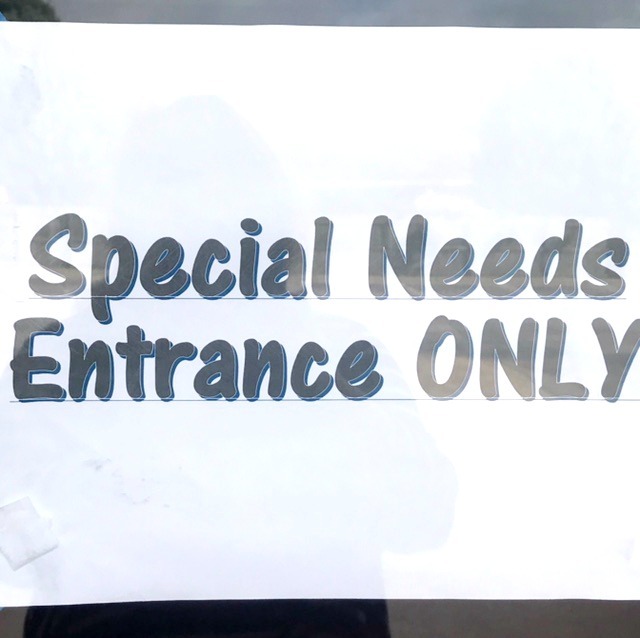 Kids with special needs have a lot of demands put on them. 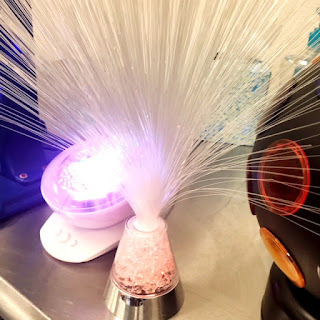 Many of our children go from working on IEP goals at school to learning chores at home to following directions in different therapies... you get the idea. Or maybe you live the life. And boy, did I feel pressure when I started volunteering. Ever read James 3:1? "Not many of you should become teachers, my brothers, for you know that we who teach will be judged with greater strictness." Gulp. God is going to call me to this ministry - and judge me harder? So I started thinking about what I knew and grew up with - song time, craft time, Bible story time, Bible verse memory time. And quite honestly, it overwhelmed me. Around that time, our church started a major remodel, and His Kids, our special-needs ministry, moved temporarily to a portable where those activities were not practical to carry out. God used that time to teach me new ways to minister through play. #1 - Ministry is not therapy. #2 - Relationships are more important than knowing all the facts of Bible stories. Somewhere, a few of my former Sunday School teachers just gasped. When you have volunteers living out God's Word, kids learn what love and kindness and patience are. The children are going to start recognizing the volunteers and wanting to see them. Then parents can head to worship knowing their child is happy and taken care of. #3 - Incorporate Bible stories into activities. We don't skip Bible stories. There is a definite lesson time for about 10 minutes. For the rest of the time, we just present the stories differently. Our volunteers have used a child's interest in dinosaurs to act out the story of Daniel in the lions' den with plastic T-rexes, named train cars after the disciples, and built doll houses while naming the figures after characters from the story of the prodigal son. One of our kids gets up on Sunday morning asking for his favorite cars in the His Kids room. We pull out those cars and name them "Ruth" and "Naomi" while pretending that the car track is the road that Ruth and Naomi traveled together. Pretending affords numerous opportunities to say, "Where you go, I will go" - just like Ruth said to Naomi in the Bible! The best activities come from building and knocking down, whether it's Legos, blocks, or giant foam tower shapes. We have seen a lot of response to building Jericho, an ark, castles for kings, and many more. Tip: emphasize that God destroyed Jericho, not humans, but let the kids knock down the structure. Just trust me on that one. Kinetic sand is another activity that leads to a lot of interaction. We can put Joseph in the well or Daniel in the lions' den or push the sand to the sides of the box to part the Red Sea. #5 - Focus on Bible truths. When I think of the story of Noah, I can make a lot of associations - Noah was a righteous man, there was a flood, the size of the ark is incomprehensible to me, when I see a rainbow, it's God's promise, and I could go on. When I say "Noah" in His Kids, I don't know what the children are thinking. What I want them to know is that Noah obeyed God and that we should obey God. 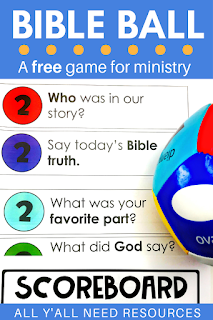 I have a free game for you that's been a hit with many of our children. It's called Bible Ball. We have a small basketball goal that attracts many of our boys. I got a colorful ball from Amazon (affiliate link). We toss the ball. When a child or adult catches the ball, they look at the color their thumb is on and answer the question with the same color to earn the corresponding points. Then, they get to shoot the ball into the basket. You get to decide how to play. It could be that points are only earned if baskets are made, that points are earned for answers or efforts, that you play a toss-and-catch game instead of basketball... just do what suits the children in your ministry. The only rule is - always let the children win! If you have more than one child, it can be one adult vs. the children. If an adult is way ahead in points, offer an amazing number of points, like 5,000, if the child can answer a question. Or take away points from the adult if the adult misses the basket. And if you don't have time to download the game now, or you want to come back to this post, just pin this image for later! 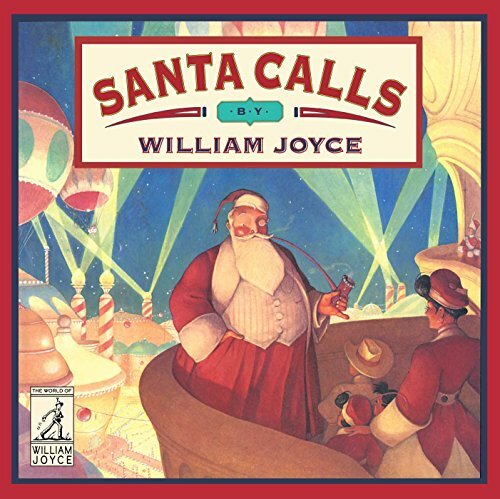 I never get tired of reading the following Christmas books. I shared new titles that I added to my library last. But these titles are some of my favorites from Christmas past. And there is no such thing as too many Christmas books. Since these books are not the newest titles, you can find most in your school and public libraries. 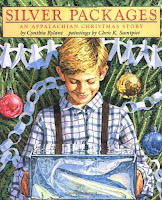 A Christmas train travels through the Appalachia Mountains each year on December 23. A rich man tosses presents from the train to the children who wait for the train on the special day each year. 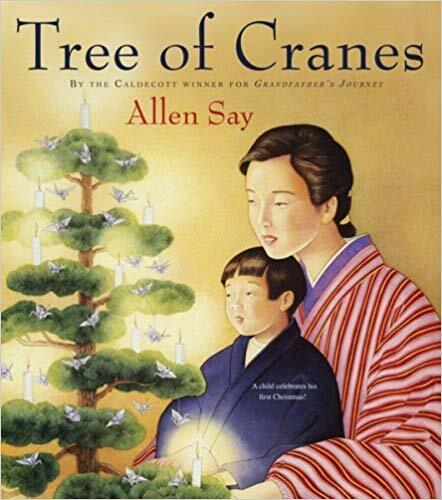 More than once, I have cried while reading this beautiful story. 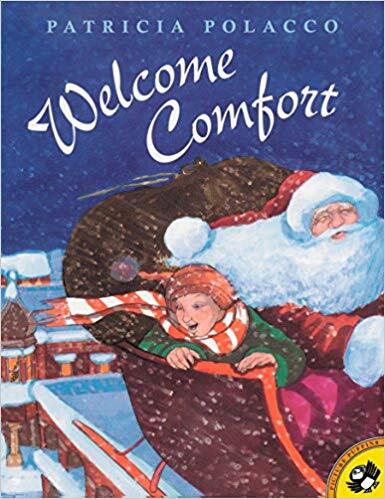 Since it is set in Abilene, Texas, this holiday book is a must read for all Texans. 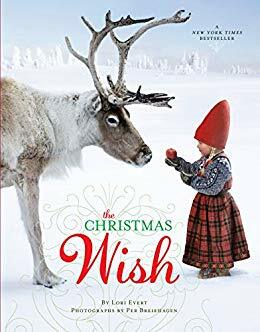 But anyone who is a fan of Christmas adventures will love this book. 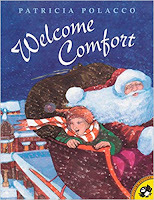 Children Art, Esther and Spaulding are invited to the North Pole by Santa himself because he needs their help. This captivating story never ages. 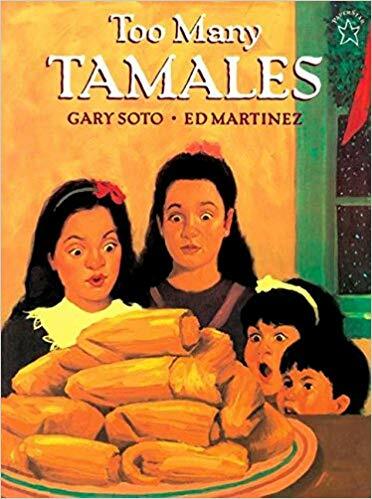 First off, who can possibly resist tamales at Christmas? The strong traditions of Maria's family are front and center in this book. All is going well, until Mama's beautiful diamond ring goes missing. The solution of eating the tamales to find the missing ring sounds like a good idea at the time to Maria and the kids in her family. Warning: you may crave tamales after eating this book. The beauty that Say is able to create with his words and illustrations is flawless in this book. No matter who I read the book to, their reaction is all the same. Two thumbs-up from students on the story of a young Japanese boy who experiences unconditional love. As a follow-up, students love learning to make their own origami paper cranes. The story of Rudolph is perfectly accompanied by Caparo's illustrations. 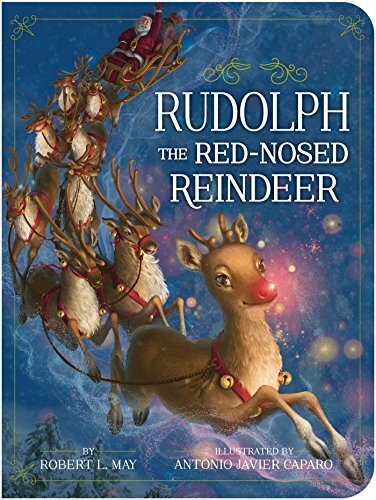 There is just something magical about a red-nosed reindeer coming to Santa's rescue and flying the skies on Christmas Eve. Because the reindeer is ashamed of her "ugly crown" she retreats to the North for thousands of years. 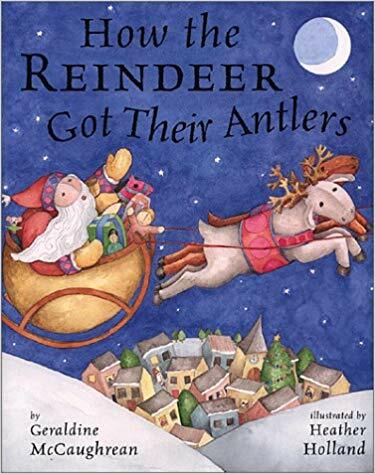 But the reindeer prove to be quite helpful to a man with a red suit and white beard. Little Anja's greatest wish was to be a Christmas elf. Anja's journey is photographed for children to experience the magic of Christmas. 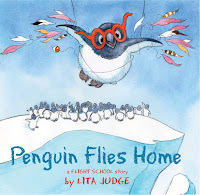 It is my belief that Patricia Polacco simply cannot write a bad book. Her rich background of storytelling is alive and well in this holiday title. When winter arrives, the animals begin looking for Bear Noel who always shows up in time for Christmas. Animal fans will love the gorgeous illustrations of the woodland animals. 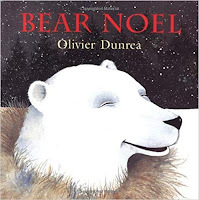 Hope you enjoyed this look at some wonderful Christmas books! Hi, it's Amy. 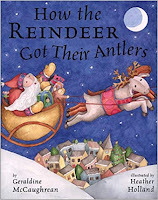 I am sharing some of my new read-aloud books for the library during the month of December. 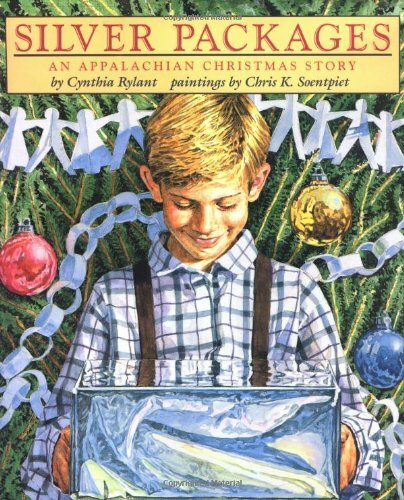 Naturally, I have my favorite books that I love to read each and every year. So to mix it up, I like to add some recently published titles to my library. I hope y'all enjoy the crazy, wonderful times that December brings! Note: this post contains affiliate links, which means that if you buy, we may get a small commission at no cost to you. First up, The Snowy Nap is the magnificent Jan Brett's newest title! Hedgie the adorable hedgehog returns for a stunning new book. 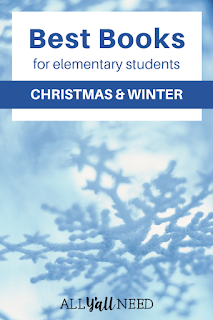 This book is perfect for those who prefer a more winter-focused title, rather than full-out Christmas story. 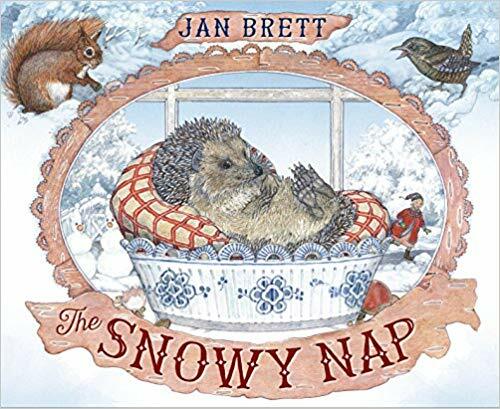 Little Hedgie does not want to nap through winter this year missing the snowflakes, frozen lakes, icicles and snowmen. Be sure to read with Brett's companion, The Hat for all things Hedgie! Let's get sparkly with A Unicorn Named Sparkle's First Christmas by Amy Young. 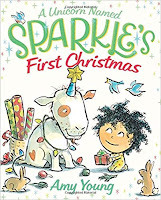 It is not Sparkle's fault that he would rather play than shop for Lucy's Christmas present. I mean, he is a unicorn! Find out what happens when Lucy purchases unicorn horn polish, a box of rainbow ribbon candy, and a stuffed unicorn for her best friend. And Sparkle does not purchase anything on Lucy's long list of suggested gifts. I have a gorgeous book for those who are looking for a wordless book. 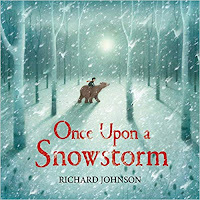 If you love using The Snowman by Raymond Briggs to teach storytelling, try Richard Johnson's Once Upon a Snowstorm this year. A father and son live in the woods and become separated from each other as they walk in a winter snowstorm. The woodland animals quickly accept and care for the boy. Animal lovers will love this 2018 publication. 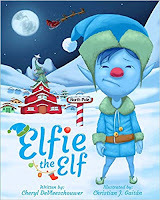 Elfie the Elf by Cheryl DeVleeschouwer is a such a cute book. A grandmother tells her grandchildren the "secret" story that she has never told anyone about when she was a little girl. A lost blue elf needs her help to be reunited with Santa himself. 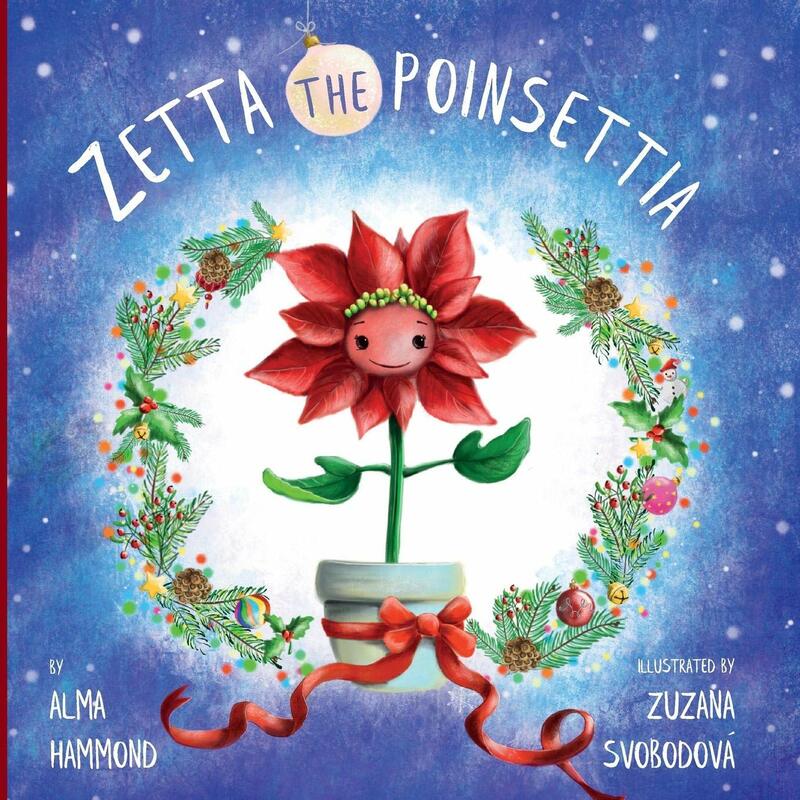 Zetta the Poinsettia is a fantastic way to celebrate Poinsettia Day on December 12. 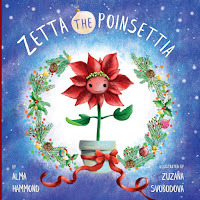 Author Alma Hammond explains the flowering plant is one of the most popular purchases around the holidays. Little Zetta wants to be purchased from her store so she can enjoy all the holiday festivities with a family. 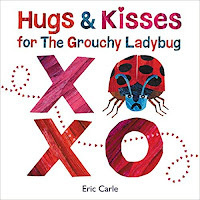 Carle's famous ladybug is timeless. 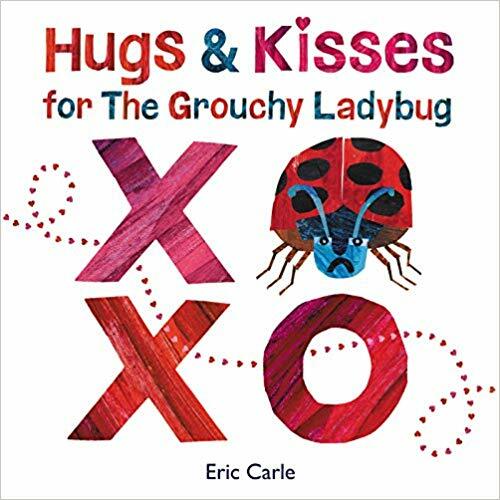 Here is a new book by Carle with his signature collage style illustrations and message of friendship. 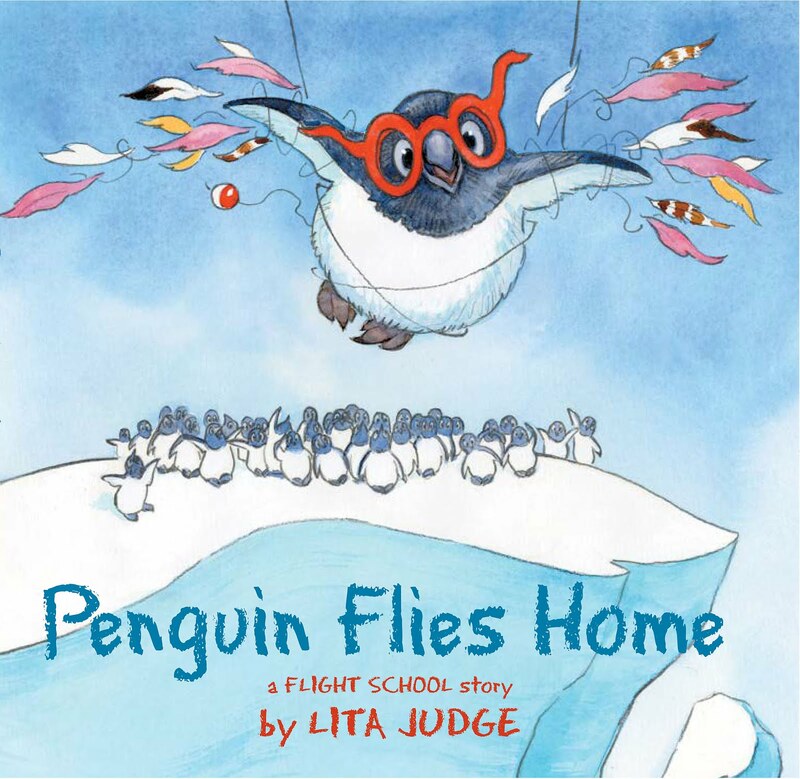 Penguin heads back home to the South Pole to teach his friends how to fly in his very unique way. But, of course, there is a problem. Teaching Bible truths is a key part of special-needs ministry. Effective lessons require repetition and addressing learning and physical needs. Here are 6 ways to teach students. God's Word is The Bible. Always use The Bible. This shows children that you are reading or speaking from the truth. We have The Storybook Bible. I love the language and pictures in it. It's more appealing to children who like color and want to look at pictures. Wait, what? Didn't I just say to use The Bible? Yes - that's for you the adult. It's hard for many of our children to sit at the table with nothing. We give them things to look at. Another resource we use is interactive books. The children can look at pictures and text. They also get to move the pictures to match the story. It can take up to 10-50 (!) times to learn a new word. Repetition is important. 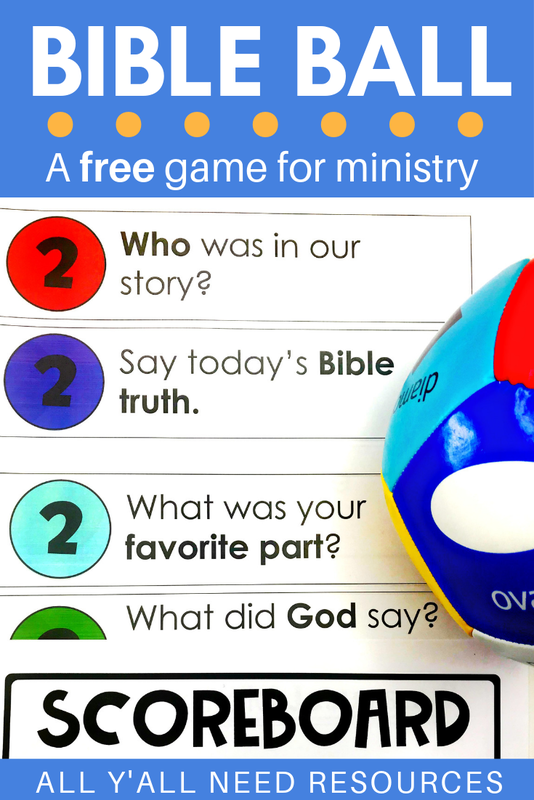 With different child-friendly Bibles and story supplements, it's easier to get in repetition. The adult reads (or paraphrases) a verse or short set of verses from The Bible. Then, volunteers point out what the child-friendly Bibles and supplements say. The NIV version of Ruth 2:17-18 from the picture above says: So Ruth gleaned into the field until evening. Then she threshed the barley she had gathered, and it amounted to about an ephah. She carried it back to town, and her mother-in-law saw how much she had gathered. Ruth also brought out and gave her what she had left over after she had eaten enough. There is a LOT of vocabulary in those verses that my children are not going to understand or relate to. Gleaning, threshed, barley, and ephah? So I'm going to take those out. While holding and referring to The Bible, I would simplify the language to: Ruth worked in the field until the sun went down. She took the wheat she gathered. She took the wheat to her mother-in-law Naomi. They had food to eat. God took care of Ruth and Naomi. The changes don't change the meaning of the verses. The changes just mean that I am using language that the children can understand and relate to more. Next, we'll look at the child-friendly Bibles and the interactive books. I'll describe the pictures and read the text in the interactive books. I'll repeat "God took care of Ruth and Naomi" with each child. For those two verses, I've now gotten in the Bible verses and 2-8 repetitions. Yeah, I know that's not close to the 10-50 repetitions we need - that will be in the next blog post. It's a start. TIP: If you have volunteers who are new, hesitant, or competitive, tell them what you're focusing on, in this case, "God takes care of Ruth and Naomi" or "God takes care of me." Give the volunteers a pen and paper. Tell the volunteers to make a tally mark every time they hear a volunteer say the Bible truth of the day. New and hesitant volunteers will be appreciative for something easy and useful to do. Competitive volunteers will start trying to get tally marks, which means tons more repetition for students! After the story, I'll tell the children, "God took care of Ruth and Naomi. He gave them food to eat. What does God do?" The children will say, "God takes care of me." Got a child (or children) who won't say it? Yeah, me, too. For nonverbal children, say, "God takes care of YOU," while emphasizing the YOU and pointing to them. 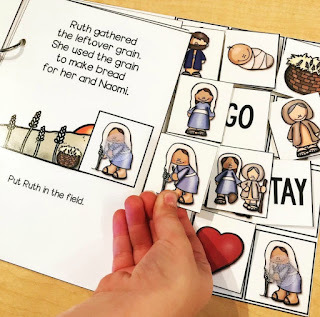 For children who are limited verbally, have them complete the Bible truth. "God takes care of..." and wait for them to say, "me!" If they don't respond, finish it for them. It's Bible instruction. We want to make it fun, positive, and practical, not force children into doing things they don't want to yet. It's easy to give up when a child doesn't participate like you think they should. Don't give up! Keep trying. Most will eventually get what you're expecting and respond. Even if the children don't respond, they're getting lots of repetition and understanding. We let children have one fidget each. I mean, how hard is it for us as adults to pay attention without clicking our pens, changing our seating positions, or looking around? 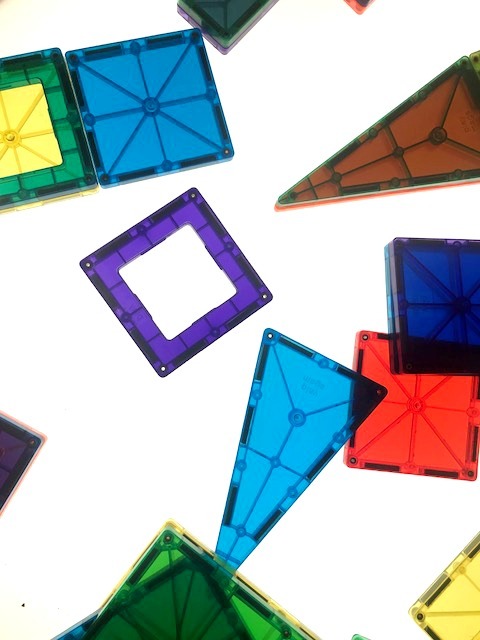 Be sure to set expectations for the fidgets - one per child only, and eyes must be on the teacher or resource, not on the fidget. You'll want to have things like squishy balls and different textures of fabric that feel good but don't want to make the child look at them. Our ministry is lucky to have a PT (physical therapist.) I'm always amazed with PT/OTs walk in and say, "That table is too high/low" or "He needs a bigger/smaller chair." We are able to adjust our seating for comfort, but our special-needs children are not always able to do that or tell us they are uncomfortable. It's amazing how much changing the table height and other small adjustments can make in student participation. Find someone who knows about motor skills and use their suggestions. Thanks for reading. Next time, we'll talk about activities that get in more repetitions with Bible truths. If you're interested in the interactive Bible books, you can click HERE. Disclaimer: I make and sell these books through a Teachers pay Teachers store, All Y'all Need. 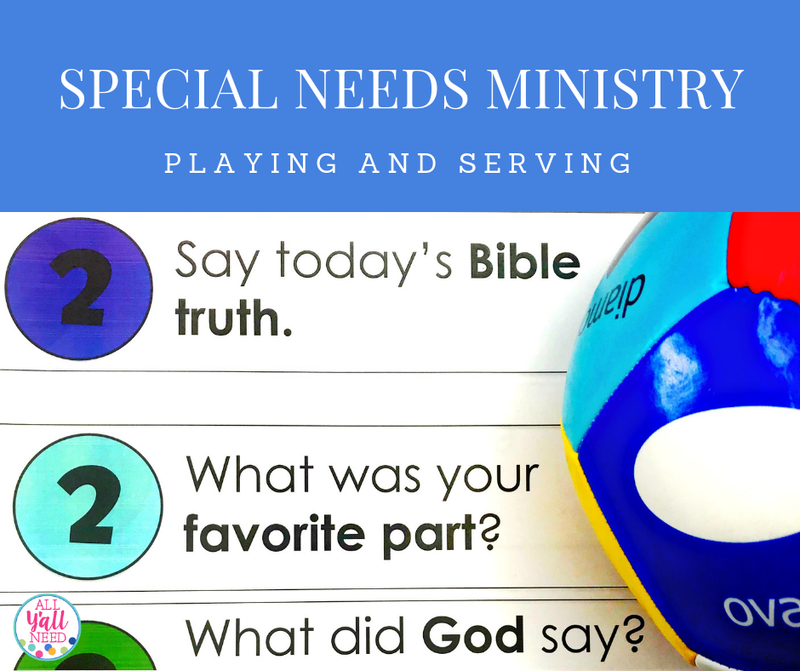 Special-needs ministry. Where to start with this? How about at my story's beginning? And I'll share with you what I have learned. Yes, you read that right. The first lessons in serving begin with what God taught me. Hi, I'm Laura. In August 2016, my youngest was headed to college. I was looking forward to doing empty-nest things with my husband. And then, Jim volunteered us for special-needs ministry. What?!? I wanted an easy ministry. 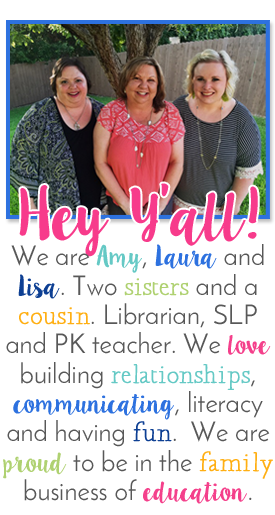 I'm an SLP (speech-language pathologist) in the public schools, and Jim is a middle-school counselor. 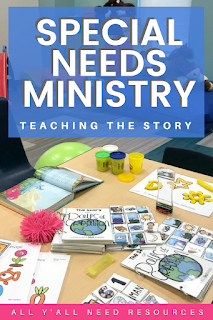 How about a ministry without kids? In fact, how about an adult Sunday School where we just listened and participated? Yep, you know the answer. God had other plans. 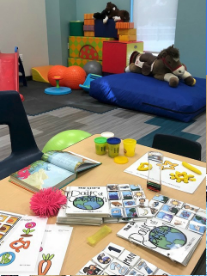 And here we are today, in a bright and shiny suite - with space, toys, and sensory items - designed to serve. Oh, there were things in the middle of volunteering and where our ministry is today, lots of things. When I first showed up, I'm sure a had a deer-in-the-headlights look. 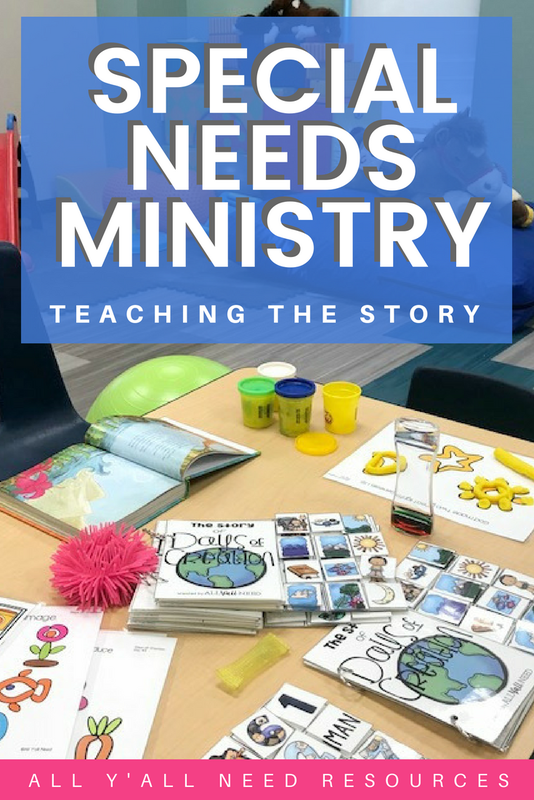 The special-needs room was not built for the ministry. 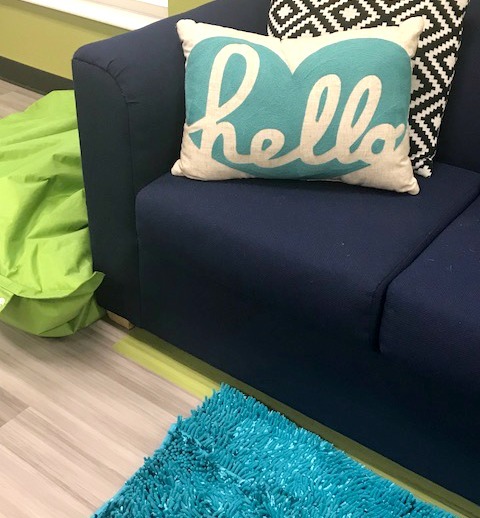 There was also some transition going on - the program was growing, some children were heading towards the teen years, and new children with more needs were moving in. And, our church was getting ready to totally remodel all of the children's wing. One of the volunteers graciously started heading up the special-needs ministry. Our church leadership recognized the need and created a position. Another volunteer started working with the teens. More children started attending. Without our church leadership recognizing the need to minister to children and families, we would have gone nowhere. Lesson #1 - Church leadership has to be invested in the ministry. 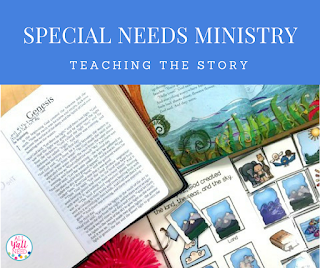 With anywhere from 15-20% of children having a disability and 1 in 7 being on the autism spectrum, ministering to children is no longer an option. It's a must. We can do a lot as individuals and teams. Without support from church leadership, we are spinning our wheels. The leadership at my church recognized that and put a lot of thought (and money) into future plans. Lesson #2 - We needed a plan. Another early lesson learned was - we needed a plan. From safety issues to medical issues, each child had varying needs. Our director set up input forms for parents that included information about the child's needs and preferences and contact information. Many entry forms are long, and they should be, so we can best serve the children. I've made you a free form for first-time visitors. It's only one page, gets the basics, and isn't as intimidating for parents and guardians used to filling out mound of paperwork. You can get the About Me form by clicking HERE. Lesson #3 - God gave me skills. As an SLP in public schools, IEPs are my life. At church, I could play, I could love, I could talk. I didn't have to worry about IEPs. But then I found that speech therapy skills transfer over into my life. One Sunday, our lesson was about Esther. When a child played with blocks, I talked about Esther being a queen and living in a castle, and that's what we built. Other volunteers picked up on that, which led to a discussion about our children needing repetition. And I've learned from others. It's a team effort. God didn't give just me skills, he gave us all skills. We need to recognize that and use our skills, not hide them. Lesson #4 - The Purpose. One thing I personally struggled with was - what's our purpose? Is it to take care of the children so parents can worship without worrying? Or is it to teach Bible truths to the children? Well, yes. 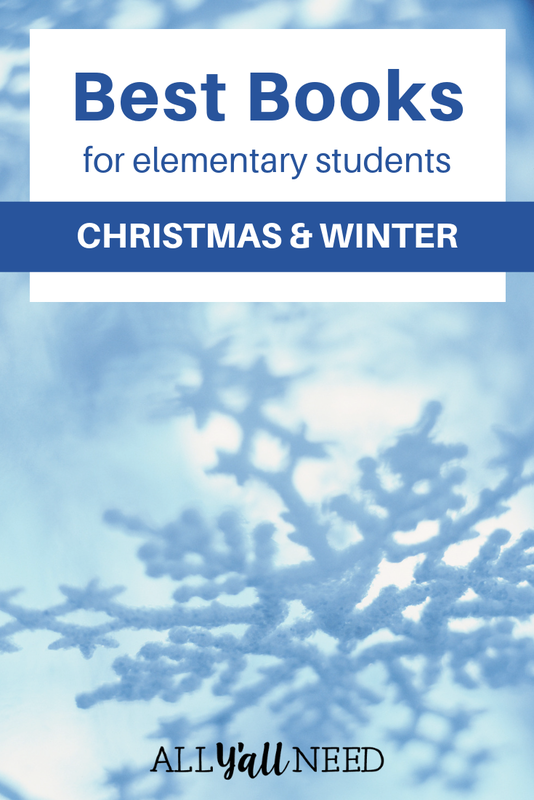 Part of our mission for His Kids (the name of our ministry) is: "It is a time for families to participate in Sunday morning church, for students with special needs to learn about Jesus in a loving and supportive environment..."
WHEW! Not exactly the easy empty-nester ministry I had been hoping for. The ministry moved to a portable for several months during renovations. 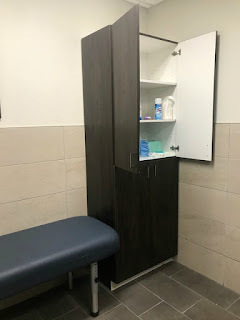 There wasn't much space, there weren't ideal toileting facilities, and it was kind of a "make it till the remodel finishes" time. But now we have a wonderful space, thanks to our director and church leadership! Let me show you around. 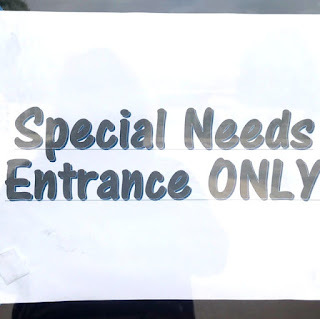 An entrance just for special-needs families. It's near the accessible parking. Children who feel overwhelmed walking through crowds can use this entrance. 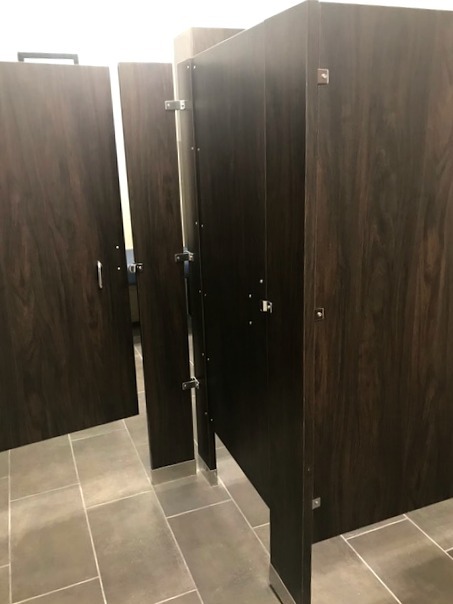 The doors lock so that we can monitor who comes in. And, they can also lock for safety in the case of runners or people not in the ministry. 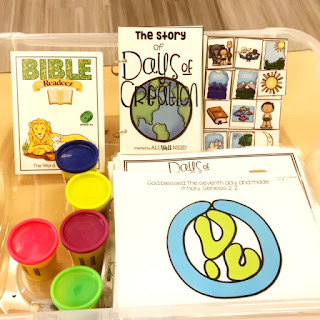 We have materials to teach Bible truths with. My favorite part is this cozy corner. 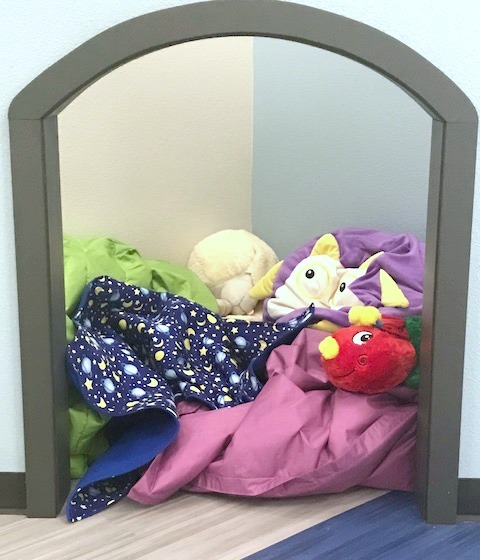 With crash pads and weighted blankets, it will be a good calm-down space or comforting place for a child who needs it. The lights in this room can be dimmed so that sensory objects can be used for calming or engaging with children. There's also a fun light table. 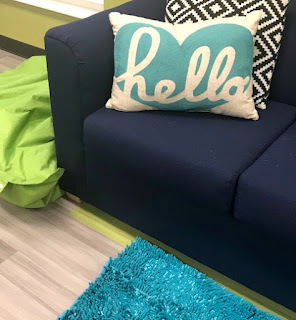 Here is our space for children as they get older. The couch and "hang-out" atmosphere are more age-appropriate for children who have moved past the toy cars and Legos. We now have age-appropriate bathroom stalls and a changing station. 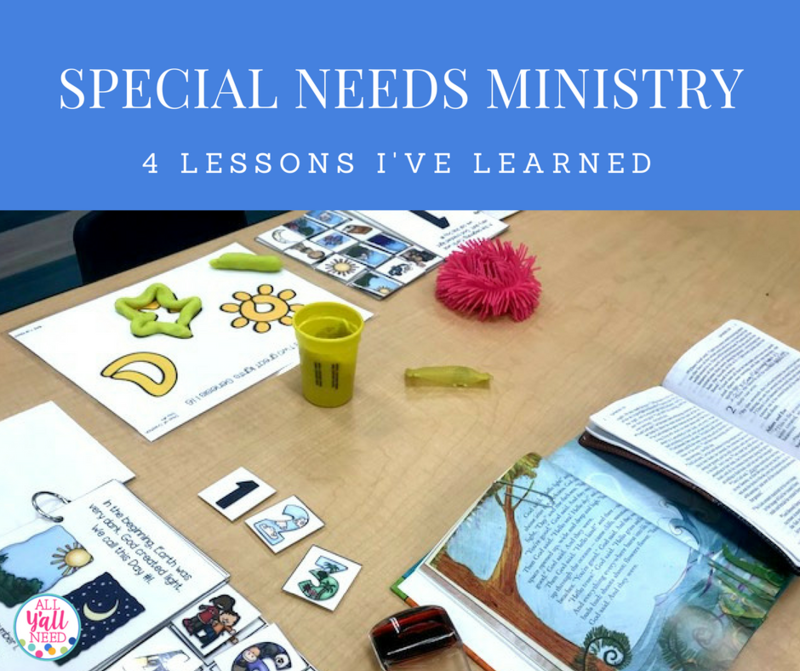 1) Church leadership must be invested in special-needs ministry. 2) A plan is needed for safety and medical concerns. 3) Use the skills God gives us. 4) Set up the room for the purpose of ministering to the children. Want to come back to this article? Pin this picture, and you can come right back to this post from Pinterest! Thanks for reading. I'll be back soon with the next post in this series, Teaching The Story.